No way does the description on the back of the box prepare you for the awkwardness that resides inside. I’ll admit, the first viewing of this movie left me kind of unimpressed, I didn’t think it was all that great, the performances were kind of flat and the story was sort of odd. I’d like to say it lacked direction but I know it was basically following Napoleon and his friends around. It didn’t seem that funny and I didn’t know what all the raving was about…then I watched it again and began to get it. It was exactly what it was supposed to be, which was nothing much, but that I think was the point. This movie wasn’t meant to be one of those “world changer” movies, nor was it meant to make you do any kind of self examination. This is one of those movies that just kind of sits there and gets better with each viewing. I’ve watched this film probably four times and it gets more entertaining each time. I mentioned the acting was sort of flat, but upon a second viewing, I figured out that the acting was spot on perfect for the characters. The popular school figures seemed livelier than Napoleon and his friends, but I think that speaks to the high school environment, where the popular kids are generally looked on as more exciting than the kids on the fringes, like Napoleon and his “gang”. There are no clever dialog exchanges between the characters, just conversations that seem awkward and real, at least between these characters. Nothing to prove and nothing to loose, Napoleon, Pedro and Deb just do what they do, with no concern how they look to everyone else. While being a movie that I think not everyone will enjoy right away, I do think that everyone who does watch it should watch it at least twice, whether they like it the first time. It’s something that takes a while to “get”. Napoleon starts his day on the bus, then craves chap-stick, meets Pedro, takes a pretty sweet jump on Pedro’s bike, meeting Deb, feeding Tina and dealing with Kip and Uncle Rico. There are some pretty entertaining exchanges between all of them; Napoleon and Deb’s first meeting, Kip challenging Napoleon to see if he can hit him, the time traveling device, Ligers, sweet drawings, and tots. I wish I could explain what exactly it is about this movie that I like but I can’t identify anything that jumps out at me besides the earnest of the performances and the situations they characters go through, being one of the fringe kids in High School, I think helps. 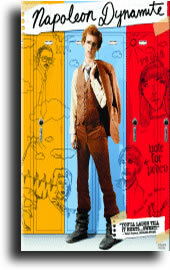 Napoleon Dynamite is one sweet ride. "Just break the grip and walk away"